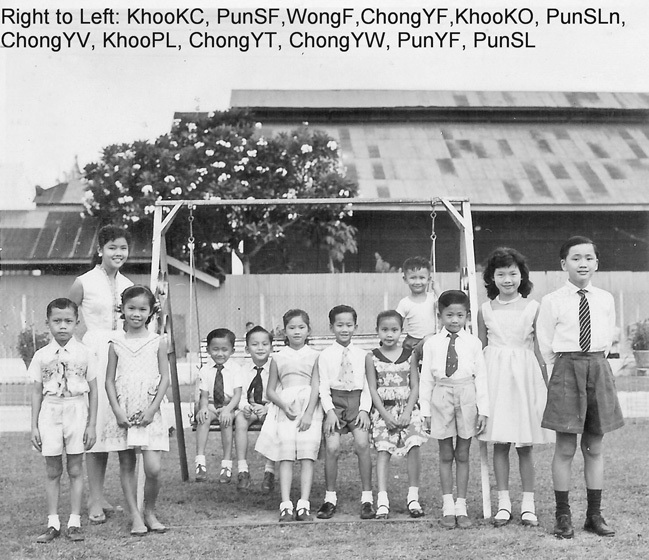 The picture showing the first 12 grandchildren of Chong Soon Fan was probably taken in 1957, during the Chinee New Year. The location is the bungalow, the family residence of Chong Soon Fan. The background building with the tin roof is the Nanyang Picture Theatre where the daughter of Chong Soon Fan was married. Among the grandchildren, the eldest grand daughter and grandson came from the Pun family. Ranking in seniority among grandchildren were as follows: SFPun, YFPun, SLPun, (FWong,SLian Pun, YV Chong, PL Khoo – all same age), YW Chong, KC Khoo, YF Chong, KO Khoo, YT Chong. Among the first 12 grandchildren of Chong Soon Fan who now resides overseas are Dr SF Pun (US), Dr SL & YF Pun (Australia), SLn, F Wong, YT Chong & YW Chong (UK) , KO Khoo (Canada). At the moment, Dr SF and Dr SL are proud grandparents., More 5th generation babies will be popping out soon. After the first 12 grandchildren, many others were born after the picture was taken and at last count, there were additional 3 residing in UK, 1 in Canada and 4 in Australia. Among the 12 grandchildren there can be found graduates in Medicine, Science, Law, Engineering, IT,Teachers, Nurses and Businessmen. I would like to invite those of you who are featured in this photograph to give your side of the history. Later chapters in this series will talk about a day in the life of the Family in in early 1960s, the other grandchildren and the golden wedding anniversary of Chong Soon Fan. The number of grandchildren residing overseas reflects the sad picture of Malaysian brain drain to the Western countries since 1950s but it also reflects the global spread of the Chinese diaspora in Western countries.